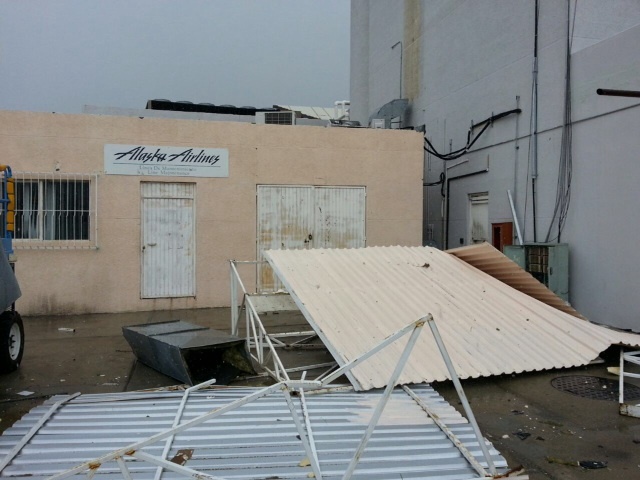 Hurricane Odile was bad. The aftermath was even worse. Amid the devastation and destruction, one bright spot was the response from Alaska Airlines employees who lent a hand when it was needed most. 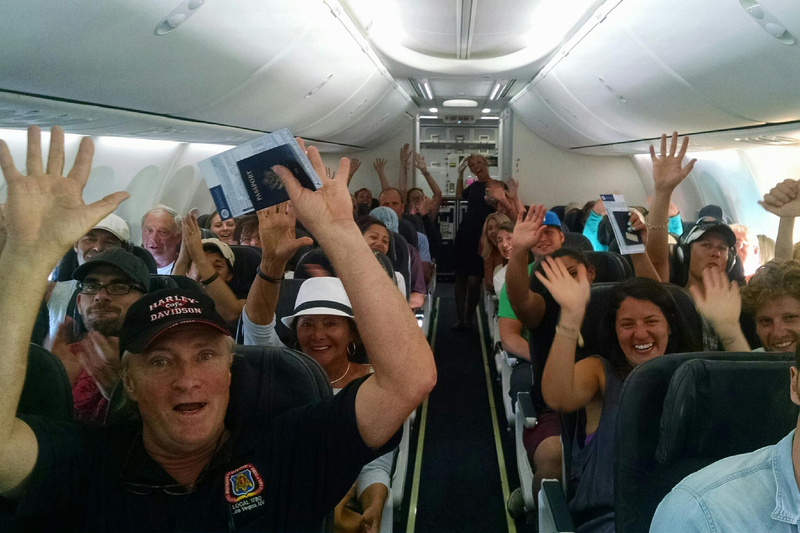 In the week since the storm slammed into Los Cabos, people who were evacuated on Alaska’s humanitarian relief flights have started to share stories of gratitude for employees – on the ground and in the air – who went above and beyond. 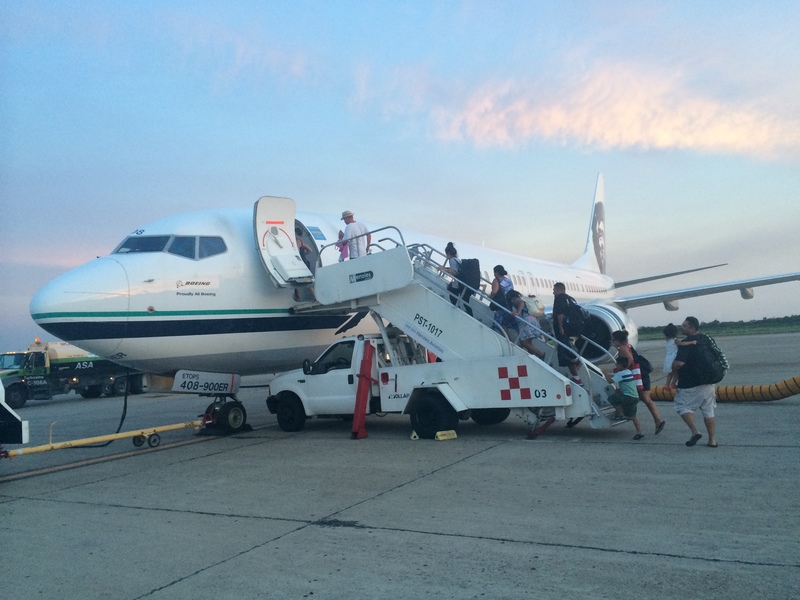 The first Alaska Airlines humanitarian relief flight arrives in Los Cabos. Many of the 25 Alaska employees who live in Los Cabos put aside their own adversity and showed up for work at the airport for three days to help people fly back to the United States. The Alaska Airlines humanitarian relief flights, dubbed Operation Ayuda – “help” in Spanish – consisted of two parts: taking food and water into Los Cabos and bringing people out. Alaska delivered 24 tons of supplies, including 36,000 liters of water, into Los Cabos and brought home about 2,000 visitors who were stranded. Aboard the flights back, crews comforted those who emerged from chaotic and confusing conditions. Free cheeseburgers and cold drinks helped, too. In San Diego, when people in line at Customs saw the flight attendants, they gave them a standing ovation. Many had tears in their eyes. Another couple on their honeymoon had return tickets on another airline, but Alaska employees welcomed them with open arms. With the temporary closure of the Los Cabos International Airport, the focus now turns to the long-term wellbeing of Alaska Airlines employees who live in Los Cabos, the rebuilding process for the community, and a commitment to help restore tourism when the area is back on its feet. 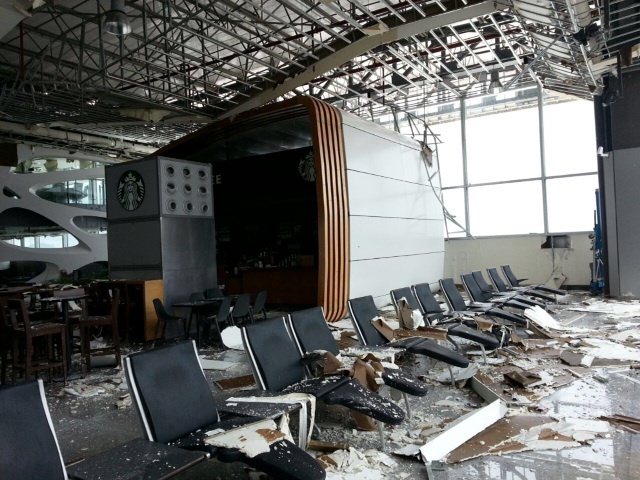 Alaska Airlines employees in Los Cabos say Hurricane Odile was unlike anything they’d ever experienced. Travelers who experienced the storm shared their stories with Danny Flores, customer service manager in San Diego. 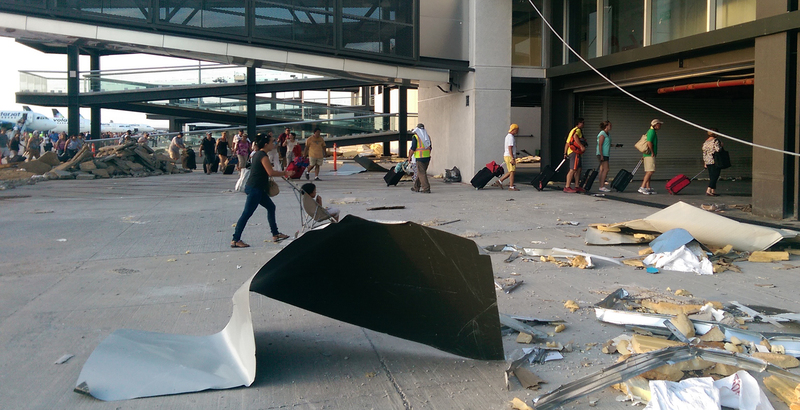 At the airport, the storm blew out windows, ripped apart the ceiling and caused severe water damage. 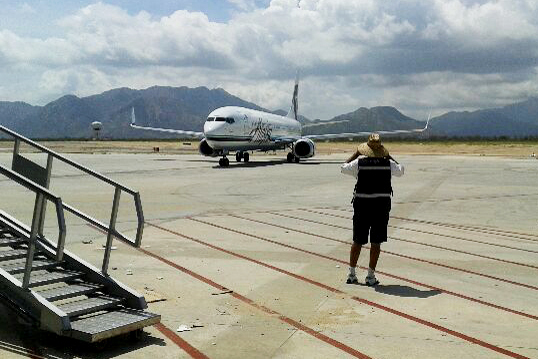 Alaska had moved into the shiny new Terminal 2 at Los Cabos less than two years ago. 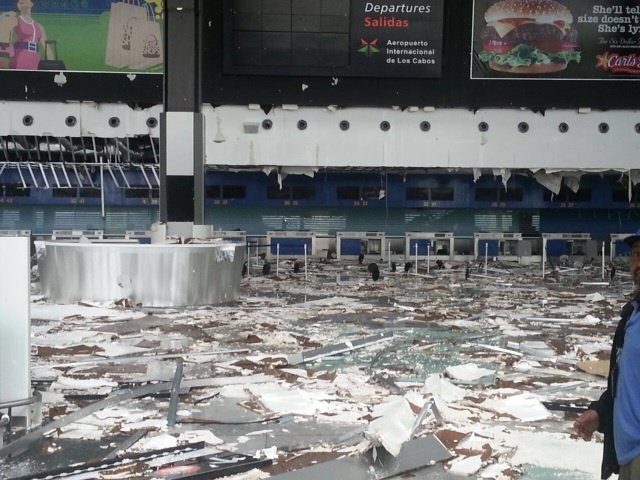 After the storm, the terminal was uninhabitable. Power, water, Internet, landline and cell phone services were knocked out. Roads were impassable. Many employees reported that their homes were damaged and flooded – mostly broken windows, soaked furniture and lost water tanks. One customer told flight attendant Beverly Sadeghi that the hurricane turned their hotel into a scene from “Titanic” – water rushed down the stairs as they tried to run down a hallway in knee-deep water. They had to leave everything behind to get out as fast as possible. At daylight, customers started to make their way to the airport. In the immediate aftermath of the storm, a top priority was establishing communication to let the outside world know what happened. Aguilar, who lives near the airport, borrowed a satellite phone from an arriving member of the Mexican military, and was able to speak briefly with Francisco Albiter, general manager of government relations and finance, in Mexico City. Albiter relayed the information to System Operation Control in Seattle and Rick Hines in Los Angeles, director of customer service-airports and station operations in the southern region that includes Mexico. The call was cutoff but the message was clear: Los Cabos needed help. As the enormity of the situation began to become apparent, Alaska Airlines began developing a plan to send relief flights. Before one meeting ended, SOC Director Wayne Newton had one important question. “Are we being safe?” he asked the group. Customers line up to have their bags searched before they board a relief flight. Employees on that first Alaska Airlines plane into Los Cabos didn’t know exactly what to expect when they landed, but they knew it would be bad. The plane was fueled for a round-trip and carried 16 Alaska employees to help out on the ground: customer service agents, ramp agents, a maintenance technician, and IT employees with computer equipment and satellite phones. Luis Perez, a contract service lead from Long Beach, was on one of the relief flights. On the way to Los Cabos, a plan was developed with ground operations manager Mike Crawford, who offered him some guidance about what to expect when they landed. “Keep in mind that the conditions we’re up against will be different than what we’re planning,” Crawford said. Employees set up tables in a shaded area to search bags. When the aircraft door opened, Perez found out what Crawford was talking about. With so much debris on the ground, simply walking was a challenge. In all the chaos, the faces of employees are what Hines remembers most. 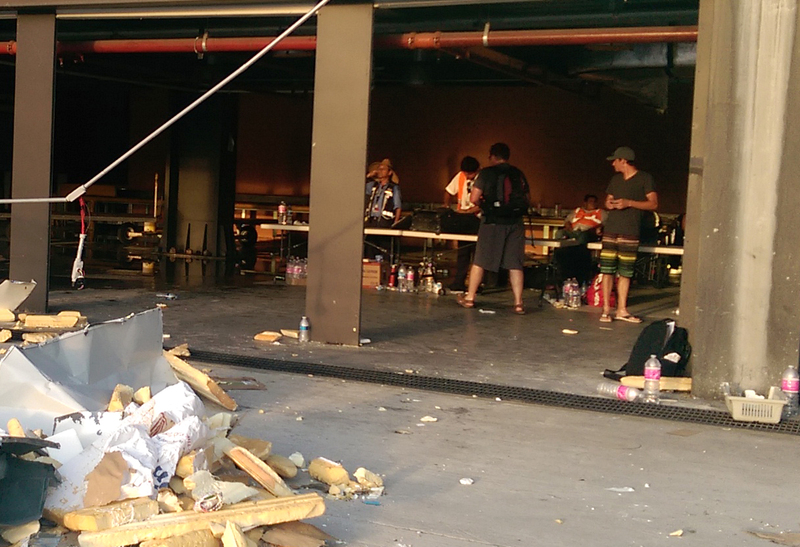 Alaska team members went back into the destroyed terminal to find tables so they could set up a bag-search area. Hines tells the story of Mayra Tirado, customer service supervisor in Los Cabos. In the early hours after the hurricane, communication was nearly impossible. So Aguilar directed Tirado to go to Mazatlan so she could call Alaska leaders and let them know what was going on. After one of the first evacuation flights, employees who returned to Los Angeles brought with them a shopping list of items that were badly needed by employees in Los Cabos. They worked through the night and spent thousands of dollars filling the orders. Many other employees worked behind the scenes to backfill positions of those who worked the special relief flights. When the team from Los Angeles returned to Los Cabos, they brought CamelBak packs full of water and strapped them onto the backs of employees on the ground, so they could try to stay hydrated as they worked. Perez made sure customers had water and that children had snacks and liquids to keep them going. During relief operations, Alaska Airlines evacuated about 2,000 people — a mix of customers and people from other airlines. During the food and beverage service, one customer said he didn’t have any money. When the boarding door closed, customers cheered. 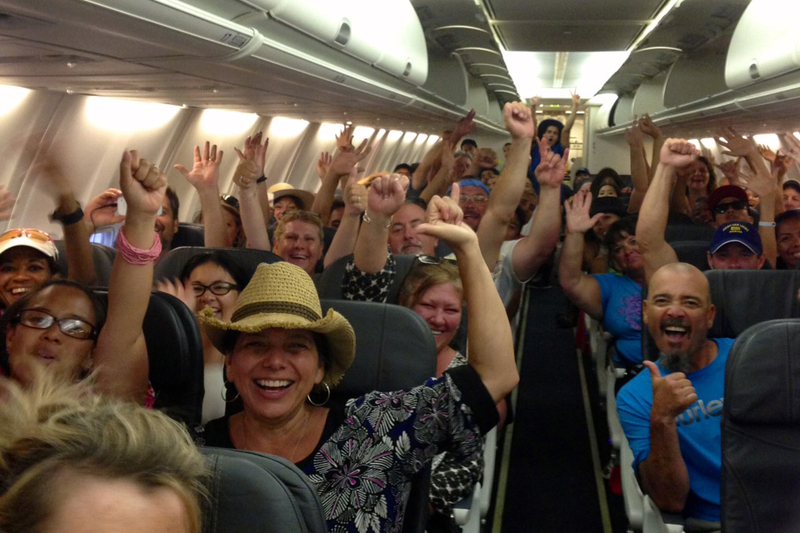 Customers on a relief flight celebrate after they were told they would all get free cheeseburgers. 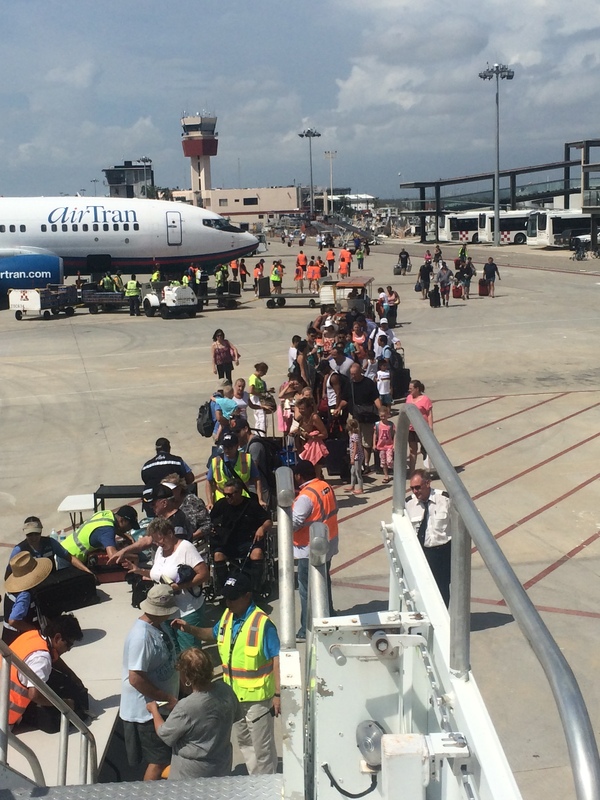 In all, nine relief flights carried 1,549 people out of Los Cabos. Two relief flights carried 229 people out of Mazatlan. A relief flight out of Loreto carried 140 people. 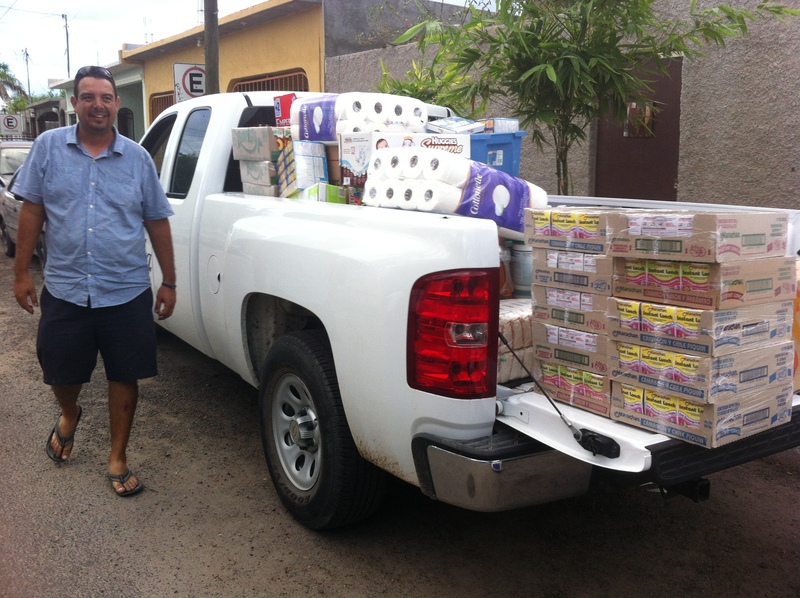 Edgard Aguilar, an Alaska Airlines customer service manager in Los Cabos, delivered a truckload of supplies for employees affected by the hurricane. In Los Cabos, local crews are working this week to restore water and electricity. “A few banks and stores have reopened, so hopefully in a couple weeks or less we should have a sense normalcy,” Aguilar said. For employees and their families who live in the Los Cabos area, volunteers from the Alaska Airlines Critical Incident Response Program will offer assistance and determine whether they have any special needs as they cope with the stress of the storm. The CIRP team helps people talk about and process their reactions to tragedy, as well as provide information on stress responses and self-care. “We want to make sure we’re giving employees the emotional support that I know a lot of them are going to need,” Hines said. 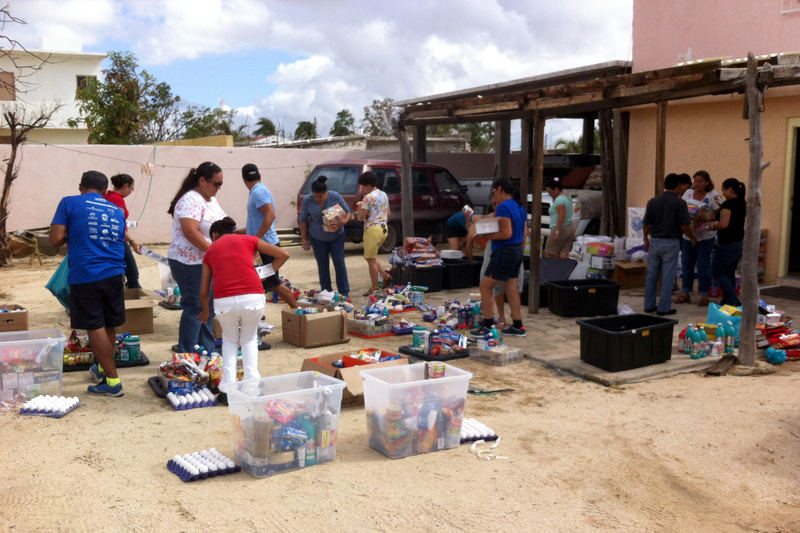 In Mexico, stations are rallying to deliver supplies to their counterparts in Los Cabos. Alaska Airlines employees in Los Cabos divide supplies that were delivered. On Monday, Aguilar, Francisco Albiter and Krystal Crespo drove a truckload of food, diapers, baby formula and other essentials requested by employees. They met with employees in Los Cabos to discuss airport recovery efforts and determine the losses that each employee suffered in the hurricane. Alaska Airlines has donated $30,000 to Alaska’s Employee Assistance Fund to help employees who live and work in Los Cabos, and the EAF has matched corporate donations to the “Los Cabos Hurricane Relief Fund,” for a total of $60,000. Alaska also donated $20,000 to the Red Cross to help with relief efforts. Many employees were relieved to learn that Alaska Airlines will maintain their wages for at least 90 days, and will continue to review the next steps after that. When the airport reopens, Alaska Airlines will be there. With employees on the ground, Alaska never really left. 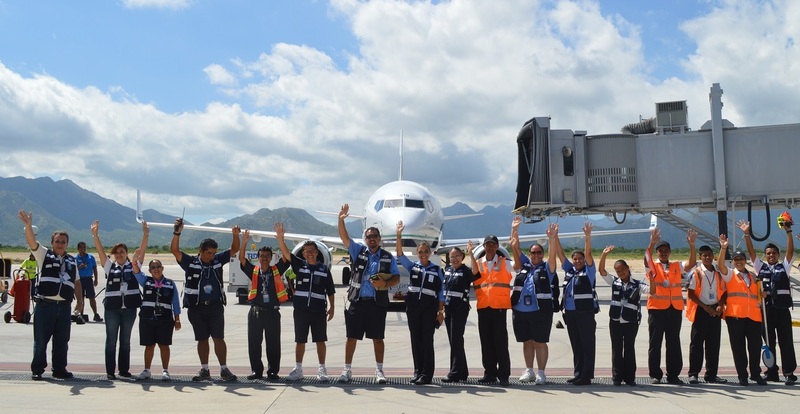 11 comments on "2014: Alaska Airlines employees emerge as heroes after the hurricane in Los Cabos"
We’re eager to resume service to Los Cabos as soon as the airport reopens. Just got an update this evening: Alaska Airlines will resume flying to Los Cabos from Los Angeles on Oct. 8. Alaska Airlines plans to resume daily service between Los Angeles and Los Cabos as soon as the airport is re-opened and the infrastructure is in place to accommodate commercial air service. 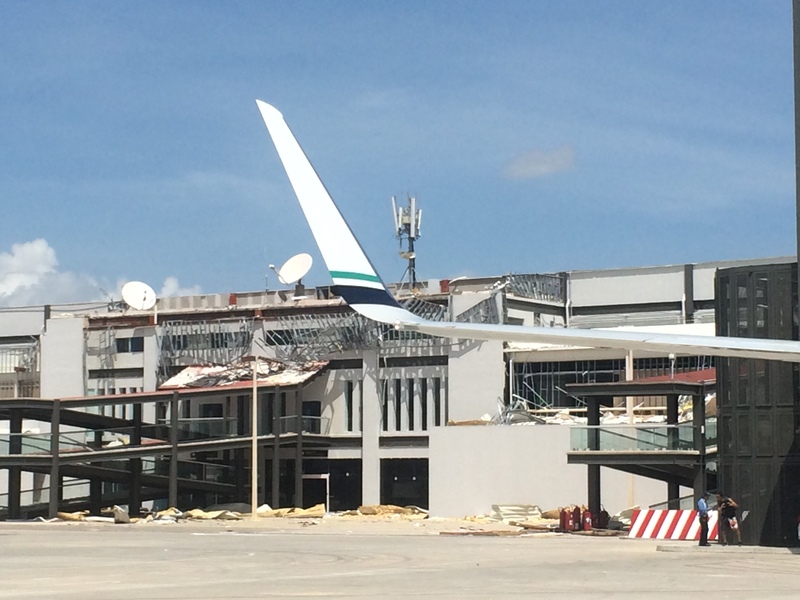 We’ll resume flying from other cities gradually once hotels have had a chance to make repairs and the area has recovered from the effects of the hurricane. Oct 8th, 2014…. We look forward to welcoming you all as Cabo IS BACK! Hi we ll start flying on October 8th. One flight a day to LAX flight number 236|251. I am SO HAPPY to see Alaska Airlines TRULY STEP UP TO THE PLATE!!!! They will be rewarded!!! So thankful that all the airlines worked together to get us out! We had Alaska tickets but were put in a group and put on a United plane to Houston. They also treated us like royalty and said they knew that Alaska was doing the same for their customers! It was an overwhelming feeling after having been told by US reps that there was no guarantee that we would get out after waiting in line for 6 hours and told we could pay $600 to go on a US charter plane out with no luggage to have been rescued by independent companies like yours because it was the right thing for you to do!! People would cheer every time one of your planes would fly in or out . . . . It gave us hope in the long line we were to endure! THANK YOU does not even begin to cover it!! Thank you Alaska Airlines for your quick response to the aftermath of Odile. Our many tourists so appreciated your “no hassle” approach to getting them home. Many more years of continued great service to the Los Cabos area PLEASE! Carolyn Alley Homeowner Cabo Bello, and frequent flyer of Alaska LAX/SJD.